Remove outer leaves and core of cabbage. Shred finely and place in serving bowl. 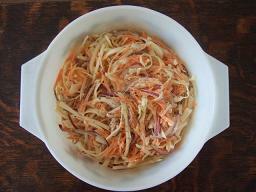 Grate carrots and add to cabbage. Peel and finely slice onions and add to serving bowl. If using cheese, grate and add now. Mix ingredients well with your hands. Add mayonnaise, herbs, and black pepper. Stir well to coat all ingredients. Peel the tomatoes, remove the insides, and chop the flesh finely. Peel and very finely chop the onion. Remove the avocado skins and the stones. 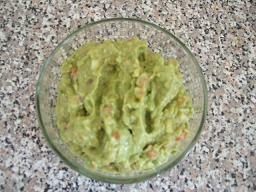 Chop the avocado then place it in the mixing bowl and pour in the lemon juice. Mash the avocado and lemon juice with a fork. Serve with tortillas or vegetables. Boil pasta with olive oil until just cooked. Boil egg for 20 minutes then drop immediately into iced water. Leave to cool. Once the pasta is cooked, pour cold water over, drain, and leave to cool. When the eggs have cooled, peel them and cut into 1cm / ½" chunks. Peel and finely chop the green pepper. 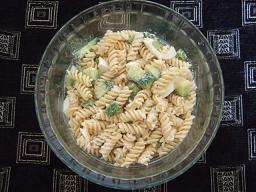 Mix pasta, cucumber, green pepper, and eggs together, add herbs and mayonnaise. If this is too dry for your taste, keep adding mayonnaise until you are happy. Keeps well in the fridge if it is in a sealed container. 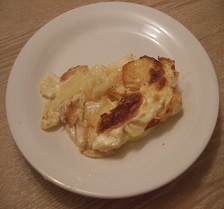 Peel potatoes and cut into 2.5cm / 1" squares. Boil eggs for 20 minutes then drop immediately into iced water. Once the potatoes are cooked, drain and leave to cool. Peel and finely chop the onions and slice the spring onions. Add mayonnaise and stir well. Place rice in a saucepan. Boil egg for 20 minutes then drop immediately into iced water and leave to cool. 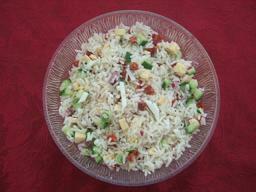 Once the rice is cooked, drain and pour cold water over to rinse and cool. When the egg has cooled, peel them and cut into 1cm / ½" chunks. Peel and finely chop the onion and slice the spring onion. Cut the chorizo, cheese, and cucumber into very small chunks (less than 1cm / ½"). Mix all the ingredients together in the serving dish. Peel and finely chop onions, place in mixing bowl. 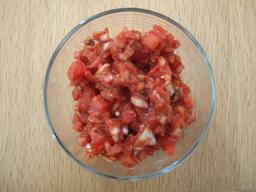 Chop tomatoes finely and add to onions. Slice the chilli and add to the tomatoes. Cover with clingfilm and refrigerate for 20 minutes. Stir well before serving with tortillas or as a dip for vegetables. 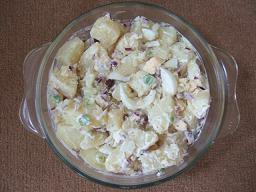 Peel and dice the potatoes into 2cm / ¾" cubes. Boil the potatoes with half of the tumeric until soft. Cook the onions, dried chillies and curry leaves (if using) in the frying pan, using the olive oil, on a medium heat until soft. Add all the ingredients and the potatoes to the frying pan (saving a little of the coriander for garnish). Add a few tablespoons of water and black pepper to taste. Stir well to coat the potaotes with the other ingredients. Cook on a low heat for about 10 minutes, stirring occasionally. Serve with a main of your choice. Put the butter and olive oil in the glass roasting dish and put in pre-heated oven until hot. Add the diced potatoes, chopped garlic and black pepper to taste. Stir well to baste the potato cubes. Cook in centre of oven for 45-60 minutes, stirring occasionally to baste the potato cubes. When potatoes turn a nice golden brown colour they are ready. Liberally butter the roasting dish. Peel the potatoes, then slice them very thinly (approximately 2mm/eighth of an inch). Peel the onion and garlic and slice thinly. 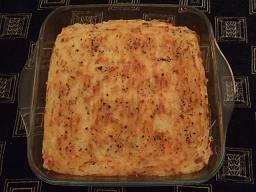 Arrange a layer of one third of the potato slices in the bottom of the roasting dish. 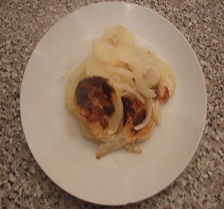 Sprinkle half of the sliced onions over the potatoes. Sprinkle half of the garlic over the onions. Grind a little fresh black pepper over the top. Add another layer of half the remaining potatoes. Add the rest of the onions and garlic with more black pepper. Add a final layer of the remaining potato. Mix the hot water and stock cube together in the jug then pour it over the potatoes. Beat the egg and mix with the milk in the same jug, then pour it over the potatoes. Add a little more black pepper, and then grate some nutmeg over the top. Evenly space blobs of butter on top then place on a high shelf of the oven. Bake for 60-70 minutes or until the top potatoes have browned. Pre-heat oven to 200°c / Gas Mark 6. Slice and cook the onion in the olive oil until soft. Serve hot as an accompaniment to a curry. 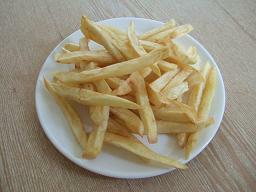 Cut potatoes into chips or discs to the thickness you prefer. The thicker the chips are, the longer they take to cook. Spread the chips on one half of the tea towel and cover with the other half, pat dry. Break off a small piece of potato and drop it into the oil. If it pops to the surface immediately the oil is hot enough, if not wait a few more minutes and check again. When the oil is ready, drop the chips in a few at a time, taking care not to splash yourself. After a few minutes, stir the chips gently, this will help to separate them. Repeat this a few times during cooking. Once the chips have browned, remove using the sieve and shake to remove excess oil. 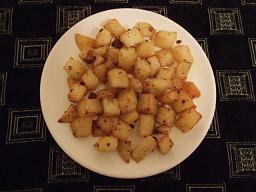 Peel the potatoes, then slice them very thinly (approximately 2mm / 1/8"). 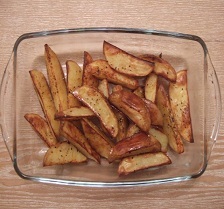 Arrange a layer of half of the potato slices in the bottom of the roasting dish. Peel and crush the garlic, then sprinkle over the potato. Add a final layer with the remaining potato. Mix the cream and milk together in the jug then pour it over the potatoes. Evenly space blobs of butter on top then place on the top shelf of the oven for 1.5 hours. 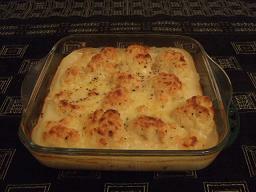 Once cooked, drain and mash the potatoes with a little butter and milk. Shape potato into 12 cone shapes and place on greased baking sheet. Fluff the sides with a fork. Using the handle of a wooden spoon, make a dent in the top of each dome. Squeeze a little tomato puree into each dent. Place at the top of the oven and bake for 20 minutes or until lightly browned. For a spicy alternative, use wholegrain mustard instead of tomato puree. Finely chop and cook the onions in the olive oil until soft, using the frying pan with lid. Add sesame oil, light soy sauce, Chinese five spice, salt, pepper and rice. Cook with the lid on till the rice is hot and steaming. Beat the eggs and stir into rice mixture. Replace the lid so the egg cooks, stirring occasionally to mix egg in with rice. For a meal just add some cooked meat or ham and serve as a main. Heat oil ready for frying. Place flour, mustard, cumin and pepper in a bowl and mix together. Using the balloon whisk, stir until most of the dry ingredients have been incorporated. Slowly add the milk, whisking all the time until you have a smooth batter. Peel the onion and cut into thick slices. Separate the rings and place in the batter. Using your hands, stir the onion about in the batter to ensure a good coating. 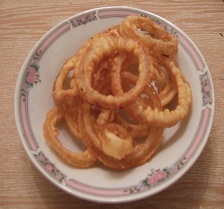 Drop onion rings into the hot oil and turn after 1-2 minutes (you will need to do this in 3-4 batches). Remove from oil and drain well on kitchen paper. Serve with dips or Tomato Salsa. Cut potatoes in half lengthways then continue cutting each piece in half until you have wedges that are approximately 2.5cm / 1" wide on the skin edge. Drizzle a little oil onto your baking sheet then spread the wedges out on top. Drizzle a little more oil over the potatoes. Apply a liberal amount of fresh ground black pepper, then dust with paprika. Place on a high shelf in the oven for 25-30 minutes. Turn potatoes over occasionally during cooking. When the potatoes have browned a little and have crisped at the edges they are ready to serve. Decore, deseed and chop peppers into 1cm / ½" squares and add to saucepan. 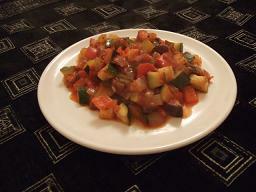 Dice Aubergine and courgettes into 1cm / ½" squares). Wash the lentils and check for any stones. When the lentils are soft (about 20 minutes) use a rolling pin or potato masher to mash the lentil mixture down. A porridge like consistency is what your aiming for. Season with the salt and add more water if required. For the Tarka fry all the Tarka ingredients over a medium heat till the onions are soft. Pour the Dhal mixture into a warmed bowl. Pour the Tarka over the Dhal. Garnish with another sliced green chilli and a handful of chopped coriander. 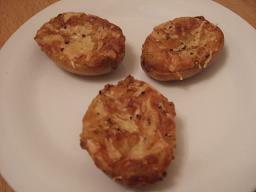 Cook the four thai fish cakes from frozen in 2 tablespoons of the olive oil, turning occasionally until well browned. Remove from pan, and put aside to rest. Add the rest of the olive oil to the frying pan. Finely chop and cook the onions in the olive oil until soft, cook with saucepan lid on. Chop the fish cakes we put aside earlier into small cubes. Add fish cakes, sesame oil, light soy sauce, Chinese five spice, salt, pepper and rice. You can buy the frozen thai fish cakes from most oriental stores. 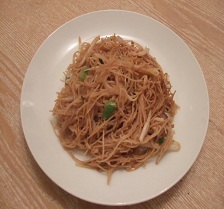 You can use Chinese five spice powder instead, if you can't get Thai seven spice powder. Pre-heat oven to 180°c / Gas Mark 4. Wash potatoes and push a skewer through the length of each potato (this helps to cook the inside). Place on a high shelf and bake for 1½ hours. When cooked, remove from oven and allow to cool on a wire tray. When cool enough to hold cut potatoes in half and scoop out the insides, be careful not to break the outer skin. Save the skins for later. Mash the scooped out potato with the butter and two thirds of the cheese. Add the herbs and spices and season with black pepper. Fill the potato skins with the mashed potato and top with the remaining cheese. Grind a little more pepper over the top. 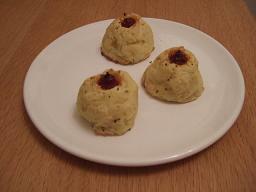 Place in the centre of the oven for ½ hour.